If you are just applying to PA school or just starting in a program, it may not have hit you just how intense it is. When they say the program will pretty much become your life for the next 2+ years, they mean it! But with all of the studying and multiple tests per week, you have to take care of yourself and find some way of maintaining your sanity. Here are some of the tips that helped me to get through it all. When you start PA school, you're going to be meeting a lot of people who are pretty similar to you and ya'll will become fast friends. A strong support system of people who can relate to what you're going through is so important. You'll not only be spending hours together during the day, but it also helps to have someone to study with, take a break with, or even cry with. Some of my best friends have come from PA school, and as much as I love my family and the friends it definitely helps to have someone to commiserate with who can actually empathize. It can become very easy to feel like you need to devote every waking second to studying, but you need to take care of yourself. By working out or doing something active, it will most likely help to relax you and get some of your focus off of the vigorous routine of school. I personally do not enjoy working out a ton, but my friends would invite me to the gym and encourage me to work out with them and I'm so glad I did. You are probably already paying for a gym membership as part of your fees so take advantage of it! If your school offers intramurals those are also fun. There's no reason to lose your interests while you're in PA school. If you loved volunteering at the animal shelter or nursing home before school, you may not be able to do it as frequently, but it will benefit you in the long run if you make the time to do what you love. Or if there's a way that you feel like your class would be able to help people then do it! A few classes above us started a free monthly screening clinic downtown in an underserved area, and it's still going strong! You can also consider becoming an officer or joining a committee if that's your thing. It's OK to not Study 24/7! And you will probably go crazy if you do! One of my biggest regrets during PA school is that during the first 2 semesters I would literally turn down any invitation to do anything. Even if it was just going to Mexican food with my parents (which would likely take about 30 minutes) or going to church. During the 2nd half of didactic year and especially now, I realize that PA school and being a PA is not my life or my complete identity, so I hope that you figure that out before I did. I also fully support recreational reading while in school because that is something I missed so much! This is something a lot of people in my class struggled with. They would refer to Augusta as "Disgusta," and while it may not be the most exciting place in the world there's plenty going on. Some of my classmates just couldn't wait to get back home and I think it made their experience more miserable than it had to be. Learn how to enjoy where you've been placed because it is likely for a short time, and there's no reason you shouldn't have a good time! Here is a post from a fellow blogger with her tips on if you are just starting PA school. And she is finding ways to not only stay sane, but to do it with kids! I'm not there yet, so check out her blog if you want advice on surviving PA school as a parent. 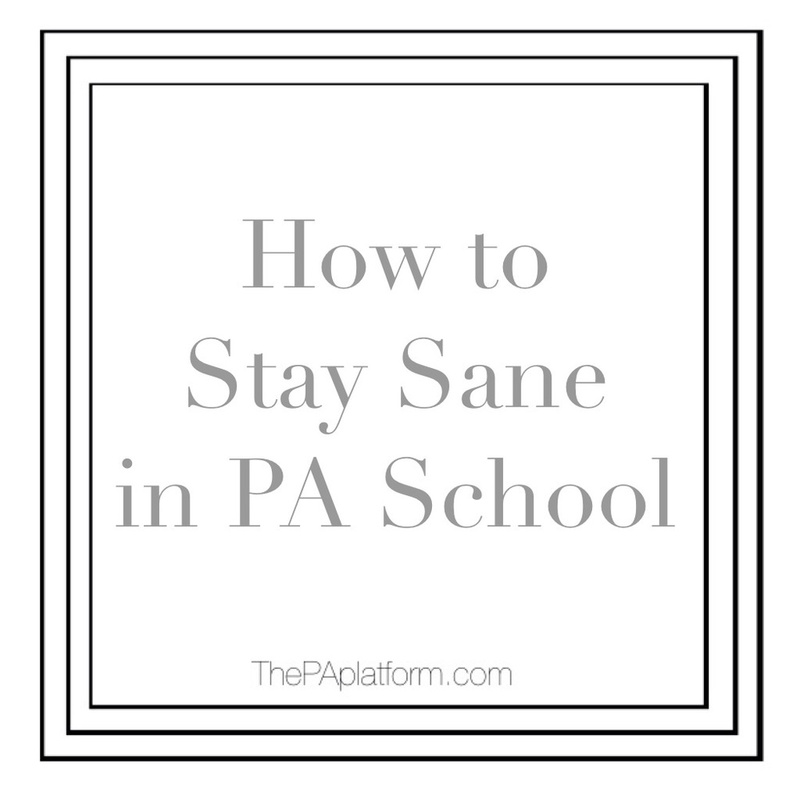 What are your tips for making the most out of PA school and maintaining your sanity?